It's been awhile since I've made you a ridiculously decadent dessert. Something that has no nutritional value at all, but you won't care because it tastes good. Everything in moderation, right? This concoction came to me, sort out of the blue, when I noticed we had two opened boxes of Chex cereal needing to be used up. In fact, I think my mother-in-law gave them to me after she had made a savory snack mix herself and didn't want them to go to waste. The hubby had just bought a package of Oreos for the kids, because of course he can't say no to them when they go to the store. 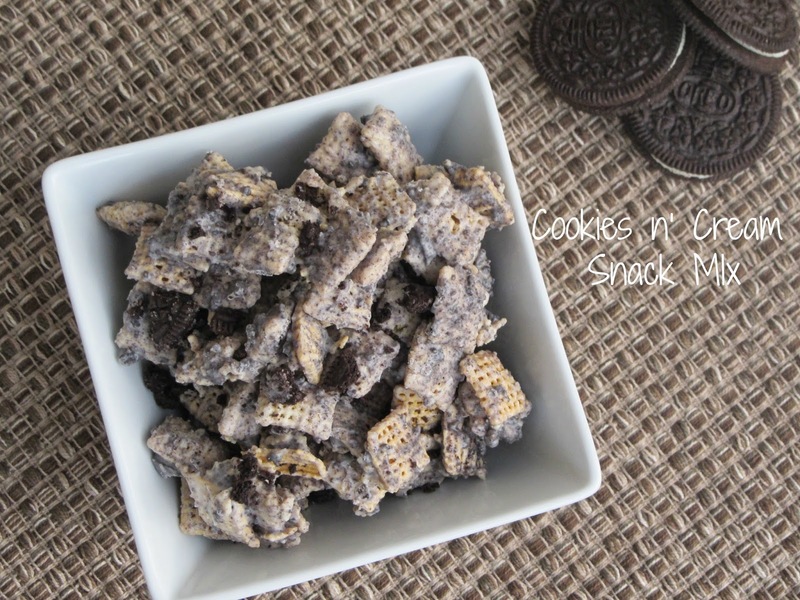 It's sort a fun little spin on the popular puppy chow everyone loves. Instead, I melted some vanilla almond bark, drizzled that over the cereal and mixed everything all together with crushed Oreos. It's sweet, you definitely only need a little bit, but it tastes just like Oreo cookies. I think even some broken pretzel pieces would be a great addition. Dump cereal into a large bowl and set aside. In a microwave safe bowl, melt almond bark in 30 second intervals until melted and creamy. Meanwhile, pulse Oreo cookies through a food processor. Drizzle melted almond bark over cereal, using a large wooden spoon start mixing together. Sprinkle crushed Oreos into bowl and fold together well. Lay out two large pieces of wax or parchment paper onto the counter. Spread mixture onto paper and let cool. Once set, store in large airtight containers. So summer vacation has officially begun in our house! The girls finished up their last day on Monday. I was afraid I would have a sad little 6-year-old again, but she did good. We're off to enjoy a little pool time later this afternoon and then strawberry picking tomorrow! This looks delicious and I love that there's no powdered sugar, so less mess.